I've left the windows open for a few weeks now. I wanted to be done with the air conditioning (although a few days of lingering heat did cause me to doubt my decision). But tonight chill air creeps in through the window, curls up around the house, and goes to sleep like the fog in T.S. Eliot's poem "The Lovesong of J. Alfred Prufrock." The mornings and evenings are getting darker, and a quiet, interior life is starting to settle in, a life of reading, dreaming, knitting, sewing, and, of course, cooking. Fall is my favorite time of year, for many reasons. The trees dress in their brightest finery, their last party of the season, the world dances with liquid light and reflected color, and streams and rivers run dark with leaf tea. And when the rains come, the chilly air carries the smells of fire and dry leaves, and the urge to bake with rich spices or slowly braise a stew takes hold. And of course, this is the season for soups: warm, satisfying soups that take advantage of a harvest of winter squashes, root vegetables, and the last of the summer vegetables. This butternut squash and tomato soup is one of my favorite fall soups, which I've adapted slightly from Crescent Dragonwagon's Dairy Hollow House Soup and Bread Cookbook, the first cookbook I ever fell completely heads over heels in love with. Warm and filling, the soup is sweetened with some maple syrup. Serve it with a piece of crusty bread for dipping and perhaps with a glass of cider for a simple fall meal. Or it could be a perfect starter later in the season for Thanksgiving. Preheat your oven to 350 degrees Fahrenheit. Line a baking sheet with parchment paper. Wash the butternut squashes and split them in half lengthwise. Scoop out the seeds and discard (or you can clean them off and roast them like you'd roast pumpkin seeds). Drizzle the cut sides with a little maple syrup and place the halves cut side down on the parchment paper. Bake the halves in the oven for 50 minutes to an hour. Poke them with a fork to make sure they are soft and cooked through. Let them cool enough to handle and to reabsorb some of the liquid that will leak out. Add the stock to the onions, bring it to a boil, lower it to a simmer, and then let it simmer for about 15 minutes. Add the tomatoes and their juices, 4 cups of butternut squash puree, and 2 tablespoons maple syrup to the stock. Let the mix heat up again. Then use a hand blender to puree the whole mixture until it's very smooth. (Alternatively, you can use a blender, but you will have to do that in batches.) Add salt and pepper to taste. Drizzle a little more maple syrup on top to serve. This is just one of many recipes celebrating fall and one of the most prominent colors of fall, orange (also my favorite color), in this week's All Things Orange Sunday Supper event. Here are all the wonderful recipes and don't forget to join in the Twitter chat using the hashtag #SundaySupper at 7 p.m. Eastern (U.S.) time. I have added many different things to my butternut squash soup but I have never tried tomatoes or maple syrup, this intrigues me. It's a wonderful combination of sweet and acid. My family loves it. What an incredible combo of flavors! Your soup looks like a hillside covered in changing leaves - just gorgeous! Thank you for joining in this week! What a lovely description, Pam! Thanks so much, and I am glad I was able to participate this week; it's such a wonderful theme. I feel tomato soup that doesn´t taste like sauce is hard to achieve, but this recipe with pumpkin sounds amazing! Might be the missing ingredient. Happy Sunday! Interesting, I've never had that problem with tomato soups, but the tomato and the butternut squash really balance each other out in this soup. This is not a combination I would have envisioned but it looks amazing!! I look forward to trying!!! If you do, please let me know what you think of it! It's definitely one of my favorites, and one of the first soups I ever learned to make. Wow - I would have never thought to do this! I love tomato soup and butternut squash soup is my favorite....so I will give this a whirl! I hope you do! Please let me know what you think when you try it! What an unusual combination - would love to try this! It's so fantastic. I've made this soup for so long that I no longer think of it as unusual! The flavor combination on this soup sounds really interesting - thanks for sharing it!!! You are welcome. I hope you have a chance to try it! Now you have me thinking about adding tomatoes to my next batch of butternut squash soup. Great flavor combo. Thanks Renee! It really is fantastic, and the color is beautiful too. I need a big bowl of warm comfort today! It's so chilly here! This would be perfect! It's chilly here today too! We had a bowl of the soup with cheese toasts for lunch, which was just a perfect lunch for a cold rainy day. I make a similar soup which I call Yamato! Fun! I am not terribly good at coming up with clever names for things, unfortunately. :) That's almost exactly what our lunch was. So good, so perfect for a chilly fall day. I was so happy we had a little left over for lunch. Thanks! Let me know what you think of it if you try it! Never thought of that combination, squash and tomatoes but I bet it is amazing!! It is wonderful, just a great balance between flavors. I love tomato soup, so I can imagine adding it to butternut squash just makes this so incredibly good! I love tomato soup too (at least homemade), and the addition of butternut squash to it is wonderful. Oh I love this variation of tomato soup because you'd never think of pairing this with squash! It's a wonderful combination! I hope you enjoy it! So innovative! Never would have paired squash and tomatoes! Yummy soup! I like the creative combo of squash and tomatoes. Oh it's wonderful! I hope you try it and let me know what you think! Wondrously yummy! Goodness that's a pretty soup! And what a unique combination of flavors. Awesome! Thanks! The color is absolutely wonderful, and it tastes rich and filling. 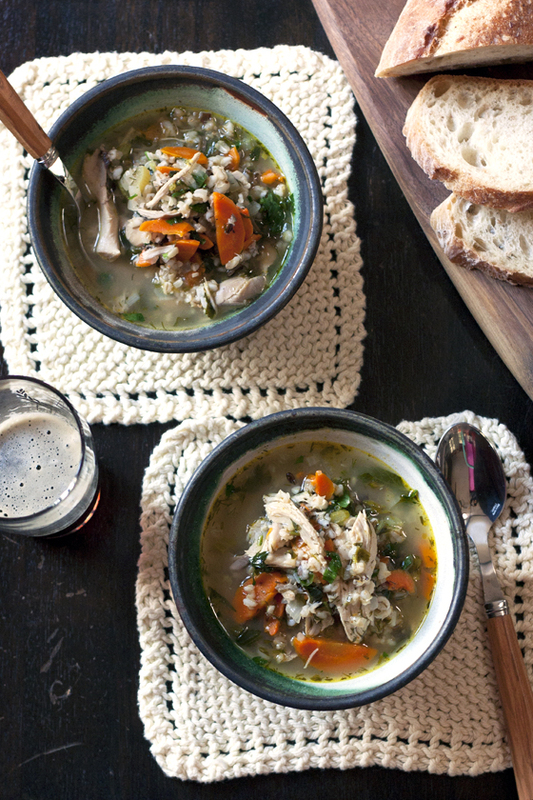 Truly a great soup for fall and winter. This soup is a beautiful color! Great job. My grandmother would always add tomatoes to her soups. They add a great flavor! This is on my dinner menu for sure. This is gorgeous. It looks inviting and pretty. Love dishes like that. You're bringing back memories of high school English class - we analyzed Prufrock to death! Great idea to add tomatoes to butternut squash soup. I hope to have chilly weather sometime in the near future so I can try it out. Butternut squash and tomatoes? It's like you are melting summer and autumn together into this gorgeous soup! Oooh, I love your description of fall. I could actually smell, feel and experience all the wonderful, cozy, autumn-y things you were detailing. I love this time of year! And so glad that we're celebrating it with delicious recipes like this one. I would never have thought of putting butternut squash and tomato together. Beautifully done! The pairing of squash and tomatoes sounds wonderful...plus a little maple syrup is the perfect touch! YUM. So many great soups!! This looks so flavorful, but easy to make! This combination sounds amazing! I can't wait to try this beautiful recipe. Beautiful soup! I love the colors! Thanks for sharing with us! I love all of these soups! And yours looks great! thanks for sharing! I think butternut squash and tomatoes would make a fantastic combination. And I love how your drizzeled the squash with some maple syrup for that touch of sweetness. Perfect! Maple syrup in my soup? Yes, please! Yummy soup! Thanks for sharing with us!